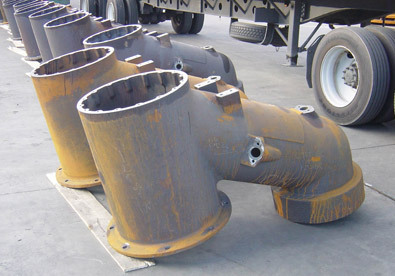 At Glidewell, we specialize in the casting and machining of ductile and gray iron. These capabilities are highlighted in the projects shown here. These items were fabricated for a manufacturer of steel mill equipment and coke ovens, whose volume and nature required a high degree of precision and consistency. Composed of ductile iron the projects consisted of six meter coke oven door jambs, wall protection plates, air boxes, goosenecks, and various hooks, levers, and fasteners. These items represent castings totaling over 5,400 lbs., all of which were molded and cast with advanced automated and semi-automated equipment. After casting, all parts were machined per customer specifications, which required tolerances of ± 0.015" prior to assembly. All of these components are subject to our stringent quality control program, which in this case includes magnetic particle inspection, and radiography. Components are manufactured in orders of 1 to 85 pieces with lead times of 10 to 14 weeks. To learn more about this project, or the processes used to create them, see the table below or contact us directly. 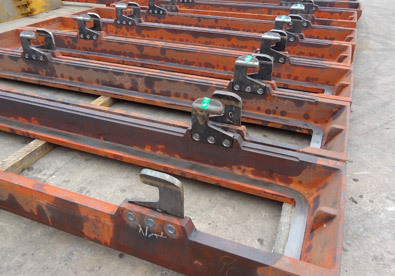 Up to 6 Meter Coke Oven Door Jambs, Wall Protection Plates, Air Boxes, Goosenecks, etc. Estimated Part Weight - 5400 lbs. 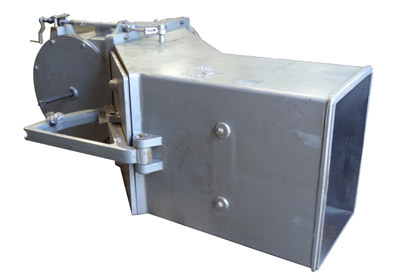 Assembly includes all parts including hooks and bolts or rivets, lids, levers, etc.